How Fast is the 1.42 GHz Mac mini G4 Compared to the Power Mac G4/800 Dual? MacReviewZone'a Ask Johnny AppleSpeed compares the Power Mac Dual G4 800 MHz vs. Mac mini G4 1.42 GHz. The Mac mini is faster in all but one test. PR: FastMac has announced it has lowered prices on its entire line of optical drive upgrades by as much as 35%. 32x Combo drives now start at $49.95 and 16x Dual Layer SuperDrives at $89.95. All optical drive purchases now include a free copy of Mac OS 10.3 "Panther" (a $50 value). Drives are available for iMacs (G3, G4, and G5), eMacs, G3 PowerBooks (Pismo and Lombard), G4 PowerBooks (Titanium and Aluminum), iBooks (G3 and G4), Mac minis, G4 Cubes, and PowerMacs (G3, G4 and G5). All drives come with a 1 year warranty and 30 day money back guarantee. "If you have a Mac chances are pretty good that one of our Super or Combo drive upgrades will work in it" said Michael Lowdermilk, Business Development Manager for FastMac Performance Upgrades, Inc. "Upgrading your optical drive is a great way to get more functionality and take advantage of the latest and greatest applications now for up to $50 less." PR: Iomega Corporation has launched the perfect companion to the Apple Mac mini computer: the exciting new Iomega MiniMax Desktop Hard Drive in 160 GB and 250 GB* capacities. The stackable Iomega MiniMax Drive mirrors the look of the Apple Mac mini computer and comes with twin USB 2.0 and FireWire data hubs, bringing increased data capacity, accessibility and flexibility to devoted users of the Mac mini. The new Iomega MiniMax Desktop Hard Drive is compact in design, but packs a lot in performance, value and features. The MiniMax Drive is just 6.5 inches square and 2 inches tall and easily stacks with the Apple Mac mini. The MiniMax Drive is a practical upgrade to the internal 40 GB or 80 GB native capacity of the Mac mini, delivering up to 250 GB* in storage capacity along with a 3-port Hi-Speed USB (USB 2.0) hub and 3-port FireWire hub. A smart power switch allows the drive to power up and down in concert with the Mac mini, and a specially designed active/passive cooling system keeps the desktop virtually noiseless. Dantz Retrospect backup software is included for hassle-free backups and data recovery for Mac users, along with Iomega IAB Pro backup software for Windows users. "Iomega's new MiniMax Drive answers the need for style and functionality that Mac mini users need today," said Brian Still, Manager of Product and Channel Marketing, Iomega Corporation. "The MiniMax Drive delivers an upgrade in capacity and the additional FireWire and USB hubs that Mac users need to utilize an array of peripherals, and it complements the features of the Mac mini without drawing attention to itself, making a great computer even better for organizing and protecting digital movies, photography and music." Users can save up to 1,000,000 photos, 4,625 hours of music, or 375 hours of video** on a single Iomega MiniMax 250 GB* drive. Multiple Iomega MiniMax drives can also be stacked together for even greater expansion capacity. Active/passive cooling system with thermostatically controlled fan. 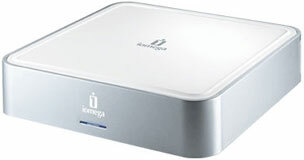 The Iomega MiniMax USB 2.0/FireWire Desktop Hard Drive is compatible with Microsoft Windows 2000/XP Home or Professional; Macintosh G3 or greater (blue and white G3 only), iMac or Mac mini computer with built-in USB connection and Mac OS 10.2 or above. The new Iomega MiniMax USB 2.0/FireWire Desktop Hard Drive is now shipping in 160 GB capacity model for $199.95 and 250 GB capacity model for $249.95. (All prices are U.S. suggested retail.) The Iomega MiniMax Drive is available online from Iomega and at other select online and Web retailers. PR: QuickerTek announces a 1,000 milliwatt (1 Watt) Plug N Play Transceiver for Apple AirPort Base Stations. Attaching to the external antenna port on the Base Station, this Transceiver offers the FCC's maximum allowable wireless signal strength. At only $450, the PNP Base Station Transceiver the perfect solution for difficult wireless areas where only maximum RF power will do. The Plug N Play 1 Watt Transceiver can be mounted inside or outside - ideal when the wireless signal must reach out from one building to another building. While the RF power is more than impressive, this product can be installed and in use by any ordinary Mac user. A waterproof 7dBi omni directional antenna is part of package too - making the products truly "plug and play". The AirPort Base Station does not not need to be opened to connect the PNP Transceiver, so high speed 802.11/b/g WiFi is finally within the reach of every Mac user. It works with all AirPort supported Mac OS versions and requires no software drivers. Rick Estes, president, QuickerTek said, "This product complements the only indoor 500 milliwatt Transceiver - ours - and is just as easy to install and use. It comes with all the cables, connectors and AC power supply to be up and running in only 10 minutes. Tim Allen of Tool Time television show fame would find the extreme power of this Transceiver completely adequate," he joked. PR: Unotron, manufacturer and marketer of high quality, washable data input and security devices, today announced the introduction of its SpillSeal protected, to IP66 and NEMA 4X standards, washable corded optical mouse product line. Available with or without scroll wheel in standard or overmolded rubberized finish, the new washable mice can be purchased in gray or black. The newly patented Unotron ScrollSeal Washable Optical 3-button Mouse and Unotron SteriMax Washable Optical 3-button Mouse complement Unotron's SpillSeal corded and wireless computer keyboards and receivers, as well as its SmartRest SRC5 Smartcard Readers and external SAC2 Standalone Smartcard Readers. "Unotron has transformed the industry with the introduction of affordable data input and security technologies that can be completely disinfected because of its patented SpillSeal(R) protection which halts the spread of infection - a major concern for hospitals, schools, government, business offices, as well individual consumers," says Unotron Director Joseph H. Carabello. "Unotron has forged new ground with its removable scroll wheel design and high-performance overmolded rubberized surface, which satisfy the most stringent disinfectant requirements." According to Carabello, Unotron's pioneering mice design configurations and materials allow these patented products to be easily washed, immersed and disinfected by commercial-grade detergents and antibacterial agents while providing users with comfort, control and reliability. SpillSeal washable mice are manufactured and assembled to support restrictive cleaning/disinfection procedures without any detrimental effect to the exterior or the products' internal components. It allows many otherwise unsupported burners to be used directly with Mac OS X, iTunes, and DiscBurner. PatchBurn 3 and 4 are just normal maintenance releases. If you already installed PatchBurn 3 or 4, there is no need to download and install the new version. There is something new - a tool called PatchSleep. This tool enables the so called Safe Sleep mode on many older PowerBooks and iBooks. Try it. It's free. PR: Looking for a less expensive, less-bloated, less Microsoftian alternative to MS Office? Papyrus Office 11 incorporates a first-rate word-processor with integrated spreadsheet capabilities, and a relational database including an intuitive user interface for instantaneous searches. For many users, Papyrus should prove a perfectly satisfactory alternative to the Microsoft behemoth. The latest version 11.27 upgrade was released this month. Papyrus has been around in a German language Windows version (as well as TOS and OS/2 Warp variants) for twelve years, as its version XI (eleven) number attests. Consequently, it is mature software, Now ported to an English language OS X version and ready to confront the colossus of production software on the Mac platform. The developers' stated philosophy with Papyrus is to make your work as simple as possible by providing carefully selected, powerful features in a ergonomic package, avoiding useless bells and whistles. "Adding 'more' can quickly become 'too much' - except for those people who earn money on bulky and slow Office-Software (generally, people who offer training seminars or sell expensive new computers)." Relational databases with a powerful search engine, suitable for a complete range from simple address databases, to multimedia applications, or complex inventory systems. You can even install (or copy) Papyrus onto a USB-Stick (or other memory card), for mobile use on visiting computers. Papyrus Office for Mac is completely compatible with Mac OS X 10.2 or newer (Jaguar, Panther, and Tiger). Papyrus Office is shipped via Internet download. Users receive a license key via e-mail, including instructions on how to download the complete package from our Internet server. PR: SteerMouse supports USB and Bluetooth mice. It will even work with mice designed for Windows PCs. You can customize your mouse freely even if there is no Macintosh's driver. SteerMouse has convenient and unique functions that Apple's driver does not include. SteerMouse makes the best use of the Mighty Mouse. SteerMouse supports the Tilt Wheel. You can assign horizontal scrolling, a vertical scrolling or shortcut keys. In addition, you can adjust the scrolling speed and acceleration. SteerMouse supports up to a maximum of 8 buttons. SteerMouse allows using extension buttons of any multibutton mouse. You can make the best use of a button which previously did not work on Mac. SteerMouse moves the cursor automatically. When a window or dialog box is activated, SteerMouse moves the cursor to a specific location on the screen: the default button; the cancel button; the close button; etc... You never lose sight of the cursor's position, because the cursor does animated movement. Shortcut key input - Assign shortcut keys. It is possible to allocate shortcut keys based on the rotation of the scroll ball and wheel. Cursor movement - Move the cursor to a specific location, such as the default button and the close button, etc. You never lose sight of the cursor's position, because the cursor does animated movement. Scroll - Scroll vertically or horizontally. You can adjust the scrolling speed and acceleration. Switch Application - Display the process screen for switching applications. SteerMouse is shareware. A single user license costs $20. PR: Prosoft's data recovery software for the Mac platform has just gotten better with the new and improved Data Rescue II. Do you have a corrupt hard drive or one that no longer mounts? Are other tools failing to even recognize your bad drive? Data Rescue II is the best data recovery utility on the market for recovering files from a problem hard drive. Other utilities can cause more damage to your hard drive and files by trying to 'fix' the problem, instead of focusing on recovering your files. An optional emergency bootable CD is also available. The Demo mode has been enhanced in this version to allow a larger file (5 MB instead of 500 KB) to be recovered. The activation dialog now allows demo mode without a customer name first. When choosing a sound to play at the end of recovery or scanning, a "preview" of the sound is now played. The popup path menu in the recovery window now displays the correct path, even when the path contains repeated folder names. Enable/disable of some user buttons and controls is improved. Some cases in which the program would appear to freeze following launch in the presence of bad disks, have been improved. A bug which caused the default size limit for TIFF files to be erroneously set too small (10 MB) has been fixed. Note: Users of previous versions will need to reset that limit in order to find larger TIFF files. A bug which could cause a few files to be accidentally missed during a scan, has been fixed. An issue with finding Entourage database files has been fixed. System requirements: Mac OS 10.1.5 or later. PR: Purplus Inc., a leading online retailer of computer software and long-time BeOS reseller, has entered into agreement with yellowTAB GmbH of Germany and is an authorized reseller of Zeta OS in the United States. Be Inc. originally developed the operating system under the name BeOS, which was acquired by yellowTAB. After an extensive redesign, yellowTAB has met their goal of producing a faster, leaner, and more streamlined operating system that maximizes the use of hardware on today's PCs. Much like the Mac was the best for desktop graphics in the 80s - Zeta is now the best OS for audio and video production today. Completely compatible with the Internet, you can set up your connection in a few clicks. Email, chat, instant messaging, and online shopping is simple and user-friendly. Virtually devoid of any possibility of viruses, it is an excellent alternative to other more vulnerable operating systems and software for the Internet. Zeta OS is the ideal alternative to Windows as it is an easy-to-use and powerful operating system. yellowTAB states they "do not intend to compete with Microsoft, but rather aim to offer an alternative for users wishing to run a second operating system." Zeta can be installed on a Windows system and it will manage both operating systems with the Zeta Bootmanager.